Discover Scuba is available during the summer dive season from June - September. Wetsuit, Mask & FinsOnce you book your dates, cancellation is allowed up to seven (7) days prior. Within seven (7) to two (2) days a rescheduling fee of $25.00 will apply. If cancellation occurs within 48 hours, fees are non-refundable. Some exceptions may apply. If you have any questions or concerns, please contact us at 705-740-9990. Not sure you are ready to commit to a full certification course but have the interest to go for a dive. Then this program is for you. The SDI Scuba Discovery Program gives you a glimpse into what you can expect to see in the underwater world as well as what you could expect to learn in the SDI Open Water Scuba Diver Course. You will be shown the basic safety procedures for enjoyable scuba dives under the watchful eye of an SDI instructor. You will learn skills like equalizing your ears, buddy checks, basic buoyancy control, and underwater communication. You will also be given an introduction to basic scuba equipment and scuba skills followed by a local shallow dive at one of our local shore dive sites. If you enjoy this experience then the SDI Open Water Scuba Diver course is your next step. Classroom & Pool session is held at Adventure Divers' facility located at 7716 Highway 7, Omemee, ON. 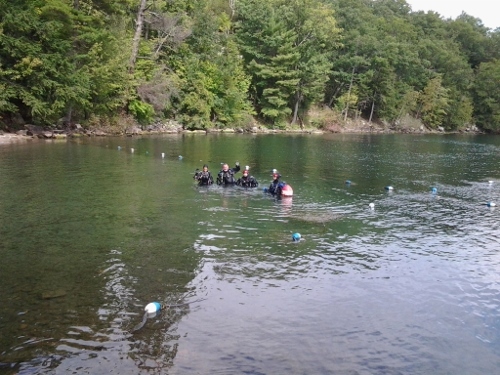 Shore Dive is held at one of our local dive sites within an hour drive of our facility.